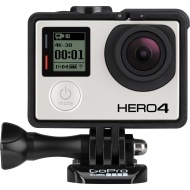 alaTest has collected and analyzed 3935 reviews of Gopro Hero 4 Black Edition. The average rating for this product is 4.4/5, compared to an average rating of 4.1/5 for other Camcorders for all reviews. Views about the design and portability are overall positive. The size and usability are also appreciated. There are some mixed comments about the durability, and there are some less positive opinions about the image quality and reliability. We analyzed user and expert ratings, product age and more factors. Compared to other Camcorders the Gopro Hero 4 Black Edition is awarded an overall alaScore™ of 95/100 = Excellent quality. It's a rare camera that can count A-list cinematographers, action sports athletes, drone photographers and professional sports teams in its user base.